A poet since the age of 8‚ Edward Estlin Cummings literally made his name by eschewing standard forms of syntax‚ grammar‚ and even authorship. He was imprisoned for suspicion of treason in World War I -- essentially because he preferred hanging out with French soldiers instead of the other members of his ambulance unit. Although perceived as a radical and a bohemian‚ he became a Republican in later life and supported Joe McCarthy's witch hunts. In short‚ Cummings did what he wanted‚ said what he wanted‚ and wrote what (and how) he wanted. Tin Hat and e.e. cummings were made for each other. Cummings loved Paris‚ living there for two years and returning many times afterwards. As such‚ Paris is where Tin Hat starts‚ infusing the opener "a cloud on a leaf" with the unmistakable sound of Django Reinhardt's legendary Quintette du Hot Club de France. Although Carla Kihlstedt's violin work is utterly different from Stéphane Grappelli‚ her unique vocal style actually dovetails with the Hot Club sound on Ben Goldberg's deconstruction of Cummings' "speaking of love." That sound makes frequent appearances throughout the rain is a handsome animal: Mark Orton's guitar and Rob Reich's accordion drive the title track down the same road Reinhardt's classic "Rhythm Futur" traveled‚ with Goldberg's romping clarinet acting as a whimsical‚ wailing car horn. Reich also adds a touch of Parisian romance to "two little who's." However‚ Goldberg's "unchanging" turns the lights down on the Club‚ going deeper and darker than Reinhardt ever went. Because she literally brings Cummings' verse to life‚ Kihlstedt is the de facto star of this riveting date. Her voice floats about on "unchanging" like the falling snowflake that inspired the poem‚ and her interpretation of the verse "this is a girl who died in her mind" sets the haunting tone for the dystopian "human rind." Although every player comes strong throughout the disc‚ Kihlstedt's violin is a huge presence‚ whether she's painting a screen of soft rain on "diminutive" or literally making her instrument cry on the mournful "grapefruit." Tin Hat is pigeonholed as an avant-classical outfit‚ and there are strong aspects of that sub-genre in the frightening free sections of Reich's "the enormous room." But Tin Hat's got big ears‚ and they listen to a lot of stuff. Kihlstedt's unconventional love song "sweet spring" has elements of Coldplay and Joni Mitchell; the funereal brass choir on Orton's "buffalo bill" evokes recent recordings by David Binney and John Scofield; Orton's dobro makes "anyone lived in a pretty how town" into an alt-country song‚ and if Tin Hat played the two-note vamp on "enormous" through a stack of Marshall amps‚ they'd have heavy-metal fans screaming their lungs out. 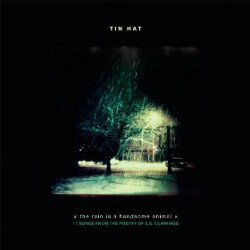 Tin Hat doesn't do background music‚ just like e.e. cummings didn't write nursery rhymes. Both the group and the poet should be viewed head-on and digested at length. Like I said: A match made in heaven… or France‚ whichever. And if the lower-case titles disturb you‚ just pretend Cummings' caps-lock is broken.